Yesterday Helen and I went over to Southport Superbikes to pick up her bike and for me to test ride a K1300s. Due to us picking up Helen’s bike, I had to for the 1st time take Helen as a pillion. It was not a pleasant experience at all, the wind really didn’t help either. The bike handled like a pig at slow speed and I got cramp in my left leg holding up the bike when waiting a traffic lights. I am so glad that Helen rides her own bike as I don’t think I would like biking much as a couple on 1 bike. 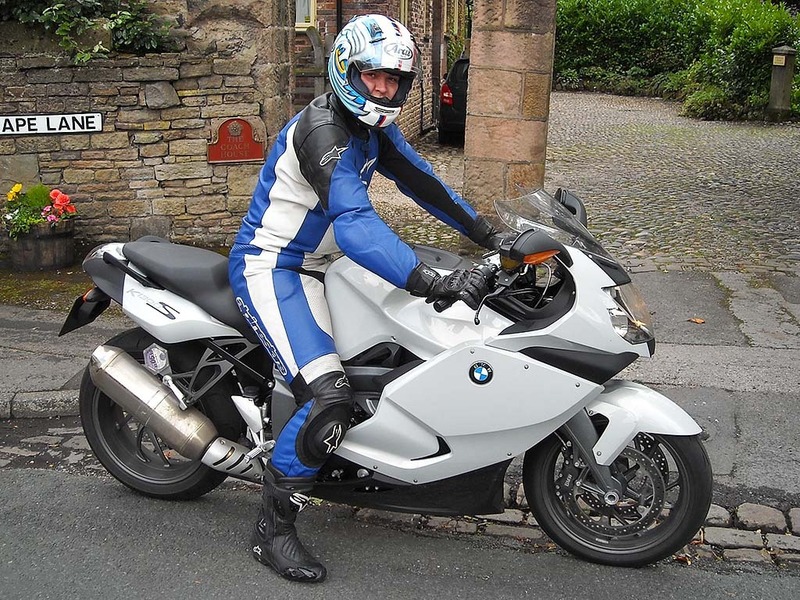 My review is going to slightly biased as I am going to compare the BMW against my VFR, mainly because I have to decide whether I would want to swap. The BMW with 175bhp and 103ft/lb is no slouch. The performance is immense with bags of power all over the rev range, even from low down in top gear. Surprisingly the vast majority of this power is actually usable and I was more than happy to wind on the throttle to the stopper. The engine is smooth with no hint of snatchiness at low revs. All in all the engine is a peach and a great asset to this bike. The Viffer simply can’t compete with this level of performance and is 1 of the main reasons for me thinking of changing. The gearbox was really smooth and I never missed a shift even when being very aggressive on the downshifts. The quickshifter is a lovely thing to have and well worth the money for the ease of the upshifts. I would say the gearbox on the Viffer isn’t as good as I do fairly often get false neutrals. This is 1 area of the bike that was a bit of a let down. At slow speed I felt much happier on the BMW than the Viffer, as it seems to hide it’s weigh very well and doesn’t want to fall over like the Viffer. The BMW was easy to turn in but was harder than the Viffer to flick from 1 side to the other. The real problem for me was once you had it turned in it didn’t give much confidence round the bend and just seemed like it really wanted to carry straight on. Whether a set of Pilot Road 2’s would help restore some of that confidence I don’t know, but it would be expensive to find out. The Viffer wins out here as the confidence it gives me in cornering is hard to beat. The brakes on the BMW are in 1 word phenomenal, they bring this big bike to a stop very quickly indeed. I tried 1 emergency stop and they stopped the bike very quickly and it was very stable throughout. A minor gripe for me is that the back brake does nothing what so ever. For most people this isn’t a problem but for someone who is used to trailing the back brake it is a minor let down. I found the BMW to be very comfortable to ride and the lean angle onto the bars for me was spot on. 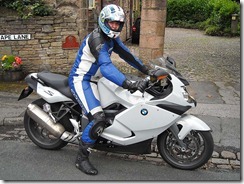 The BMW felt more roomy than the Viffer which actually felt awkward and cramped when I got back on it. My arms didn’t ache at all after my 2 hours out on the bike, even going slow through town, I wouldn’t be able to say the same about the Viffer. A minor gripe is that there seems to be slight vibration through the bars, it didn’t really cause any problems but potentially could on a very long day. Well it isn’t a Honda for sure, in some areas it looks cheap (plastic front brake reservoir for 1). Considering the price of this bike it should ooze quality and I quite simply think that it doesn’t. From what I have read the switchgear seems to be causing problems for some owners already as well. The BMW is a very capable bike and as a touring bike it fulfills in pretty much all departments. I would be more than happy to have it over the Viffer on a long tour around Europe. However as an A to B or day bike I am not certain which bike I would prefer, to really decide I would need to ride 1 all day around the Dales or the Lakes, but unless I buy 1 that isn’t going to happen. The real problem for me is that this bike is way overpriced when you add in all the extras, I would say £2,000 to £3,000 overpriced. As a low mileage 2nd hand bike with £4000 off the list price then it would be a serious contender for me. Whats next? I will probably wait till next year to see what Honda do and whether any 2nd hand K1300s come on the market. The other possibility is to try a Sprint ST1050, from what you read everywhere it is a VFR beater, we will have to see.